It’s Tuesday night in Cusco, Peru, and I’m sitting in a white plastic chair in the second story of a University administrative building with twenty-two locals, two assistants and two organizers. The fluorescent light glares off the white tile floor, and the sound echoes. We’re gathered here for an introduction to Circling, but things are getting heated and the crowd seems to be turning against me. Two seats to my left the dean of the department, wearing a suit and a tie, sits in quiet reflection. A few minutes ago I interrupted him in the middle of a prayer. I loathed the way he was speaking for everyone… I barked at him—“I respect you but I cannot stand this. When you speak your fancy words about Unity and our inherent Divinity I feel spiteful… ” he interrupted me and tried to pray away my challenge, smiling, unconsciously neglecting my perspective because he was afraid of conflict. “When you speak, I feel utterly empty. I’m lonely and full of pain. And I imagine you feel the same way.” The rest of the group chimed in and started to share how his words were impacting them: frustration, annoyance, anger, fear. It was a painful, beautiful moment of self-awareness when this dean stepped out of his subjective reality and started to see it as an object in a much larger system. It stopped him, and he realized how disconnected he’d been from his heart and his body. For me it was a moment of transcendence: transcending my habit of avoiding conflict, of wanting to be liked, of pretending like my motivation for staying quiet was care (instead of self-preservation). I stepped into the vulnerability of not-knowing anything about where this kind of heart felt confrontation would take us—potentially revealing more about dark shadows in my leadership than revealing what (I assumed) was wrong with this chaste dean. Indeed—now that the group has broken the social norm of politeness, of respecting authority by keeping your mouth shut, they’re ganging up on me. Back in the stark light of the Cusco Circling introduction, I feel even more lonely, and hopeless. The feeling of hopelessness is the only thing I can share audibly… the words croak on the way out of my throat. I feel inadequate. They’re trying to cheer me up now, but it pushes me further into isolation. I sink even deeper into the hard, smooth plastic of the chair. “Why don’t you sit up so you aren’t so weak?” The black haired woman on my left asks, looking up from her phone. “Weak? With all of you trying to change me, challenging our way of being, and me staying with it, I feel quite strong.” I respond. This momentary flash of passionate anger belies my loneliness. And I’ve sat up more fully. Then a fifty-year old woman with a crooked smile starts to see what’s happening: I’m demanding nothing; I’m taking full responsibility for what’s occurring in my world (or at least attempting to). I’m not trying to defend the practice. I’m letting each person’s share move me and give me useful feedback. I’m surrendered to the truth of the moment, and I’m trusting that this interaction, and the collective intelligence of us being together—even if I “fail” by all traditional accounts—is revealing an important and beautiful truth far more meaningful than anything I could dream up in my limited perspective. Yet here I was, assuming they were missing me and that they needed to learn to “be with” what is. Wasn’t I still subtly blaming them, instead of taking responsibility for my reality? Wasn’t I unconsciously assuming that I wasn’t perfectly acceptable as I was, needing to prove myself and my value as someone with embodied wisdom (and therefore assuming that I wasn’t enough)? Looking back now, I can see more clearly the source of my feelings of inadequacy, and I don’t have to spend so much energy hiding that from the world. This woman with a crooked smile starts to share her experience, and I don’t feel so alone in my loneliness anymore. It’s nice to feel someone with me. My assistants feel the same. They’re asking the participants to go deeper with their reactions. “How is it to feel this way?” We’re getting guidance to be with them in their world—in their yearning for truth, for understanding, for skills they can take home. “What has you reacting the way you are?” “What’s it like to show up tonight wanting to fix a problem and not getting a straight answer?” These simple questions require us to turn into the unconscious discomfort driving our decisions, rather than letting our habitual pattern of avoiding discomfort drive us. These questions require all of us to get intimate with what’s occurring. Soon others are sharing what they’re learning. “It’s not about following the Catholic or Andean rules, it’s about speaking from your heart,” one young mother says, her son bouncing on her knee. a muscly man shares. “I never knew how closed off to other points of view I was,” a third calls out. They’re learning to make their own lessons from what’s occurring, and I’m starting to light up. These wouldn’t have been the lessons I’d teach. I’d probably sound like the suit-wearing dean, trying to talk about the power of inter-subjectivity or the tetra-arising and tetra-evolving of each moment. They’d be tweeting about Adele’s new song instead of learning about triple-loop learning and Constructive Developmental Theory. My timer quacks and it is now time to move from the big group of 27 people into three smaller groups; to move from a surrender meditation to a concentration meditation. “When you were trying to fix my loneliness, I think that’s how you treat your own loneliness. I think you get mad at that part of you. That whenever you feel something you don’t want to feel, you assume you’re broken and you try to fix yourself. You can’t love in others what you don’t love in yourself. A way of being aware of the relationships that already exist with everyone and everything. A way of being willing to stay open and present and inquire more deeply into your assumptions about what’s true. A way of getting ever more intimate with yourself through presence. your lesson is always what’s right in front of your face. This feels good to say. I take a sip from my water bottle and feel a new quality of connection with the group; one of intimacy and shared experience. People are nodding their heads. I’m shocked to see lot of people smiling. I exhale, and lovingly squeeze my friend Philip’s shoulder. I’m always willing to welcome the full range of human experience, but it sure is nice to feel good. This is what Circling is… today. It is different every time, but it is always paradoxical, always a pursuit of truth, always connected, always revealing something unique and valuable to each participant, if they’re willing to let themselves and their understanding of the world be changed by the process. This is the way of interacting that Alanja and I will be sharing at the IEC this year, and we’ll love to meet you there. Jordan Allen – With CirclingEurope I lead practice groups, retreats, and 6-9 month transformational, integrally informed leadership programs. Most exciting—I’ve just created a new video breakout technology to Circle (integral relational meditation) online, with 2 facilitated sessions everyday and members and facilitators from around the world. I’ve just published “A Beautiful Apocalypse”—an integral novel (endorsed by Ken Wilber) to guide readers through an experiential feel of developmental altitudes. 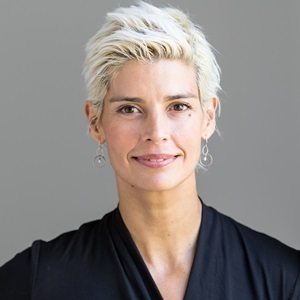 Alanja Forsberg has since she was a child had an extraordinary vivid curiosity, subtle sensitivity and complex understanding on human relationships and the emotional patterns that connect us to the social field. Her life-long study on the human mind from different areas, such as psychology, psychodrama, social work, theatre, integral theory, spirituality, and motherhood, has led to a cutting- edge approach to personal and relational development. Her passion is to break through the mental and emotional obstructions that holding us back from our essential freedom, our loving-wisdom and creative life-forces. She is now an internationally recognized expert and teacher in authentic meeting and intersubjective psychotherapy, and co-leads a world-wide practice-community (Circling Europe) committed to authentic and conscious self-expression. From her home-base in Gran Canaria, she frequently runs experiential workshops (“All There Is”) and week-long “Avalon”-retreats on the healing and transformative potentials of the human intelligence in Nature. Focus on you: pounding heart, being seen – it’s circling!